The Google Pixel 2 and Google Pixel 2 XL is about to remedy the fatal flaw that left my original Pixel XL vulnerable, broken and hobbled for snapping photos. Yes, the photos were great while it lasted and the bump-free camera design was touted as innovative, but it was a case of be careful what you wish for. 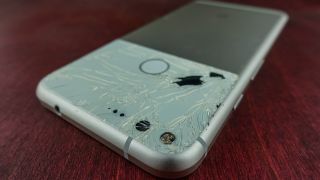 A shallow drop of my prized Google Pixel XL onto cement proved that Google's odd glass-and-metal back shattered right through the most important part of the phone, even if the camera wasn't the point of impact. There's no bump and no border around the camera on this phone. It's all one piece of glass, unlike the mostly bump-free Samsung Galaxy S8 and Note 8. Here's where things are about to get different in the Google Pixel 2 series. The two Google Pixel 2 phones appear to include an important protective border around their single-lens camera, according to the latest leaks. The camera lens also appears to be masked by a separate piece of glass. There's less of a chance of similar spiderweb crack incident that gets worse over time. The bump-free camera design seemed ideal when the Google Pixel and Google Pixel XL launched 12 months ago. But it can lead to a gory ending, as pictured. The front glass? Sure, that's an easy and common repair service. But the back glass required replacing the entire back, including the aluminum and frame. I didn't take them up on that offer. It was too costly. So I'm left with a Pixel XL that's still good for Google Daydream View, but no longer the ideal camera. As you can see from the link below, my colleague had a year to remember thanks to the Google Pixel's spec-defying camera. While I'm happy for him, I'm just going to keep sitting here with my broken, optically-useless Pixel XL until the Pixel 2 XL release date.